I'm not certain I could name 200 great comics characters, like Wizard Magazine is the process of doing in conjunction with one of their anniversary issues. I think that by #180 I'd be throwing things out like, "Random Wee Pal!" "Biotron!" "Limon!" 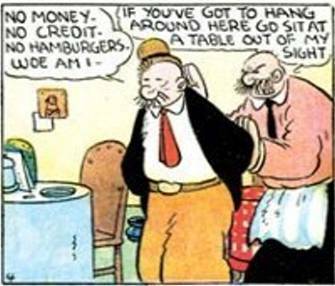 However, I hope that Wizard and all of you will agree with me that little doubt exists as to the #1 greatest comics character in the history of the medium: J. Wellington Wimpy, from EC Segar's Thimble Theatre. All you really have to know about Wimpy is that he'd gladly throw over all of his friends and loved ones for a plate of hamburgers. I found this hysterically funny as a kid; I find it even more so now. 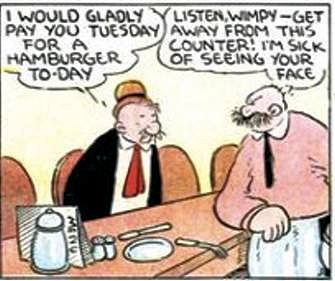 Wimpy is the first modern character in comics, by which I mean he's a contradictory mess leaning towards the awful. He's smart, lazy, annoying, dishonest and completely amoral. He has the best catch phrase of anybody ever -- "I will gladly pay you Tuesday for a hamburger today" -- which achieves greatness because of the "gladly" and the specificity of "Tuesday." He ignores everybody else on the page and exists in his own bizarre world. He adds nothing in the way of moral instruction. He's every friend you ever had that you couldn't explain to anyone else, and every person you heard a story about that made you mad at the person telling it. He's perfect and I love him. All hail J. Wellington Wimpy.